Thank you for bringing Gordon to us. We see what you meant when you said that he is "wonderful." Jim has bonded with him, and it's a beautiful thing. Gordon is such a knowledgeable and caring person. I just want to reach out to you to let you know Audrey, Kadie and Stacey have been absolutely wonderful for my father. He is very relaxed when they care for him. Each caregiver is doing a fantastic job and we appreciate you finding the perfect team for us. 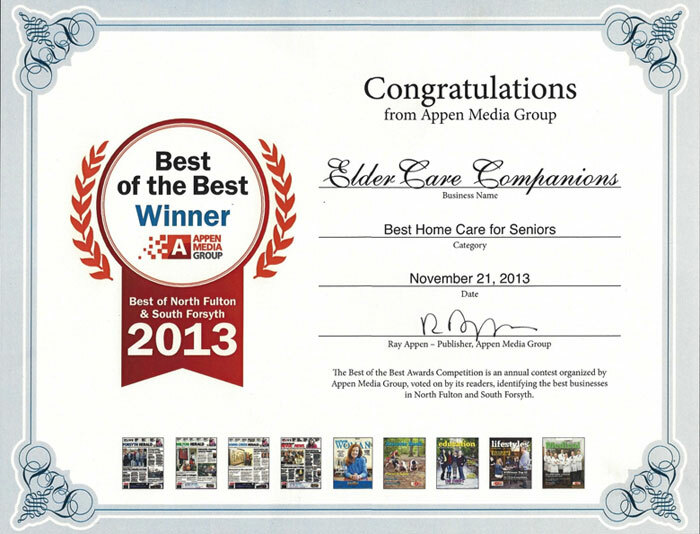 I would highly recommend Eldercare Companions. All of the caregivers that Hillary provided were conscientious. One even went "Above and Beyond" during a snow/ice storm because she was afraid my mother would be alone. I have not met Hillary but felt that after over a month of long distance calls, we became friends. She and her caregivers were very helpful and comforting. "We thank you and your wonderful care givers for the support and the joy each one has brought into our lives." Hillary's agency was highly recommended to our family when we found ourselves needing additional care for our mother. Both she and her staff of caregivers were attentive and warm in providing the help that was needed. It was such a relief to know that someone competent and caring was by her side when we could not be. Many of the caregivers went above and beyond in taking care of Mom. In fact, within just a few days of engaging Hillary's group, Mom's room was cleaner, she looked better fed and well groomed, and there seemed to be more "joy" in her spirit. I can only attribute this improvement in Mom's quality of life to her team of caregivers. I would highly encourage you to use Hillary's firm, you will not be disappointed. I would like to highly recommend Hillary Abrams’ company to take care of your loved one when you need extra help. Working with her to find the right “match” for my great aunt, has felt like a partnership; both of us striving to provide the best care possible for her. If any difficulties present themselves, Hillary is quick to discuss them and ameliorate them. She always keeps customer satisfaction, mine and my great aunt’s, foremost in her mind. And it is obvious that she really cares that your loved one is happy and well taken care of. All together, I cannot recommend any other company as highly as hers.